Slate blue short sleeve ruffle hem dress with pockets. Cute and comfortable doesn't have to be difficult. Pair with your favorite leggings and sandals for a fun going out look. Scroll down for more info. Slate blue ruffle hem short sleeve dress with pockets. Cute and comfortable doesn't have to be difficult. Pair with your favorite leggings and sandals for a fun going out look. Scroll down for more info. Black legging with white swans and faint polka dot print. Super soft and comfortable, these one size (0-14) leggings are perfect for pairing with your favorite long cami and kimono. Scroll down for more info. Sunflower vest scarf. Don't be afraid to dress up your favorite t-shirt and jeans. This floral lightweight piece pulls double duty as a scarf or a vest. Scroll down for more info. 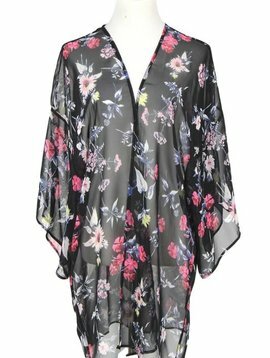 Sheer black floral and botanical shawl kimono. Add a fun layer to your favorite t-shirt and jeans. Scroll down for more info. Baseball Love raglan tee in charcoal with black sleeves. 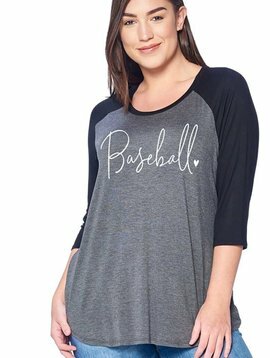 Show off your Baseball Love with this super soft and stretchy tee in curvy girl size 1X-3X. Scroll down for more info. Floral embroidered short sleeve dress with lace up neckline and pockets. A dress with pockets can do no wrong, and it's sure to be your new summer favorite with sandals. Scroll down for more info. Ivory swing dress with bright, modern floral design and 3/4 ruffled sleeves. Nothing beats a light comfortable dress with pockets, perfect for spring. Scroll down for more info. Feelin' Willie Good graphic tee in black. The country crooner is known for having a great time and always feeling really good. 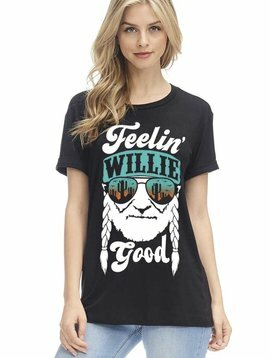 Jump on the Willie bandwagon with the perfect tee for the lake or a concert. Scroll down for more info. Spring blue square tunic with half sleeves and pockets. The birds are chirping and so is your closet, ready for bright colors to make an appearance. Sail into spring with an easy breezy top. Scroll down for more info. Dusty Rose lace kimono cardigan. Sometimes a super cute outfit needs a touch of lace!!! Dress up your favorite jeans and a tshirt or your favorite little black dress. Scroll down for more info. Ocean blue lace kimono cardigan with tie front. Sometimes a super cute outfit needs just a touch of lace!!! Dress up your favorite jeans and a tshirt or your favorite little dress. Scroll down for more info.